And here is the first completed project off my list, the quilt for Baby June. It also falls under the Modern Quilt-Along umbrella, as the pattern is Once Upon a Time from The Modern Quilt Workshop. 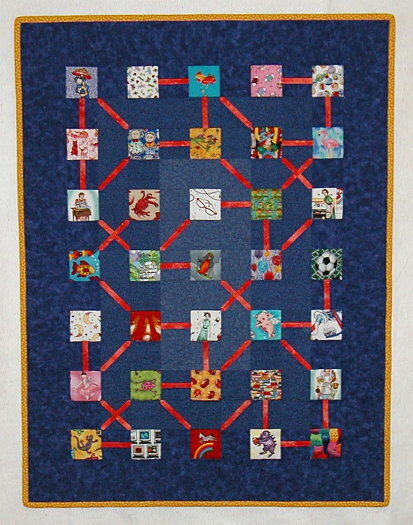 Of course, as with the other quilt I’m doing from the book, I had to add my own touches. First, it’s not any of the sizes listed in the pattern, and second, I think my head would implode if I had to use only one background fabric, so I used three. I also chose a Fossil Fern for the lines between the story squares, so it’s got more movement than the tone-on-tones shown in the book. Yeah, maybe I do have a short attention span. 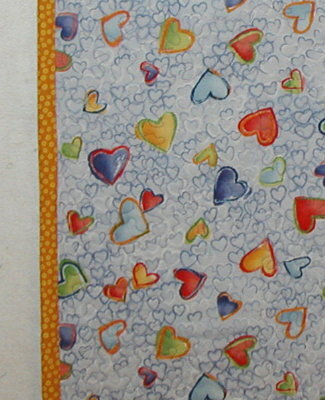 I picked this heart print, which I used for the backing, as my focus fabric. I chose it because it’s another colorway of one of the same fabrics I used in this baby’s older sister’s quilt back in 2002. I had no trouble finding 35 prints in my stash for the story squares; the problem was narrowing down the selection. I considered I don’t know how many and think I cut about 50 squares for audition purposes. I didn’t have the right fabrics for the background or story lines, though, so I took the hearts fabric to one of my local quilt shops and pondered bolts until I found three purple tending toward periwinkle ones that coordinated with the hearts and were close enough in value that they would blend but far apart enough that they’d provide some variety. I got the coral for the lines and the yellow for the binding then, too. I considered lime green in place of the coral lines but decided it would be too bright and blend into some of the squares too much. The top went together pretty fast. I did do some rearranging of the blocks on the felt wall, of course; I’d be amazed if I ever sewed something together the way it first went up. I pressed the seams of the line blocks open, but pressed the seams joining the blocks to one side because I really didn’t want seam allowance shadowing to distract from the lighter story squares. The quilting did not go fast at all, and nearly made me want to cry several times. I decided I wanted to stipple around the story squares and lines to make them stand out and to blend my three background fabrics by coloring them with the same purple thread. 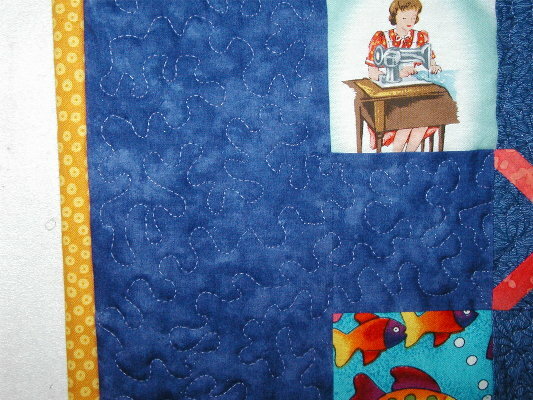 I don’t know if my machine is dying or if I’m losing my touch or what, but I had many troubles with the quilting. My top thread broke a lot even though it wasn’t anything delicate. I couldn’t get the tension right. I especially couldn’t get the machine to run at a consistent and reasonable speed, which means my stitch length is all over the place, which the quilt police most definitely do not approve of. I had a bobbin fly apart, something that’s never happened to me with this machine ever. I ripped out and redid some sections early on, and at one point seriously considered taking it all out and quilting it with straight lines like Blair and Rose did on theirs, but I decided to forge ahead. I am hoping that the baby’s mom, who’s a very skilled quilter, will be too distracted by her beautiful daughters to notice my not so beautiful quilting. I pondered putting the directions for using the quilt to make up stories on the label but ended up doing my usual format with the baby’s name and picture and my name and writing out the instructions in a card. Of course, the baby doesn’t talk yet, since she was just born in June, so she won’t be picking a square and following the lines to other squares and telling a story as she goes for a while, but maybe her sister will. I’d love to hear what they come up with. I don’t know how I’d spin a tale about some of the possibilities–a soccer ball to toothpaste to a flying pig? But kids have good imaginations, so I’m sure the girls will do just fine. One year ago, I bravely revealed my love of Multiples. Two years ago, I did a goal check-in. Remember those? Remember when I had goals? Three years ago, I weighed 146.5. Wow. Those were the days.